The flooring is a crucial part to every room in your home and wood can look great in kitchens, dining rooms and living rooms. Wooden flooring brings a number of benefits to your home, including a fantastic aesthetic appeal and hardwearing, durable qualities. There are two main types of wooden flooring you’re likely to find. Both have their qualities, with cost and durability being the main difference between the two. Solid wooden flooring is usually between 18 and 20mm in thickness and popular woods used include maple, oak, walnut and cherry. These wooden flooring panels are manufactured at random lengths with a tongue and groove system used for installation. For ease of installation and a longer lasting finish, narrower strips of wood tend to be more successful. Anything less than 83mm in width is known as a strip, whilst large pieces are called planks. The more you spend, the better the grade of wood. You’ll also have less knotting in the more expensive purchases. Once installed, solid wooden flooring is expected to last many years, provided it’s well maintained. Maintenance is simple and wooden floors can be swept or mopped clean. Engineered wood flooring tends to be 14mm in thickness, with 4mm of plywood backing. This specially made flooring is available in a number of formats and can even be fitted above the existing flooring. You’ll find engineered wooden floors are easier to install and are often more stable. On top of this they can be sanded over the years to improve the look, without the worry of damaging. Of course, these are just an imitation of real wood flooring. For this reason they won’t be as durable and long lasting. But in the same manner you’ll find cheaper prices amongst the engineered wooden flooring industry. Wooden flooring has a certain aesthetic appeal not matched with carpets or tiles. It can look brilliant in newly decorated rooms and brings a very traditional sense to homes. If you’re interested in wooden flooring, complete our quick form and receive up to four FREE quotes from local, vetted and reputable installers. 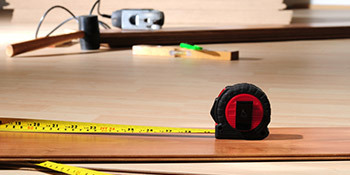 This is the best way to find cheap wood flooring and reduce your installation costs.